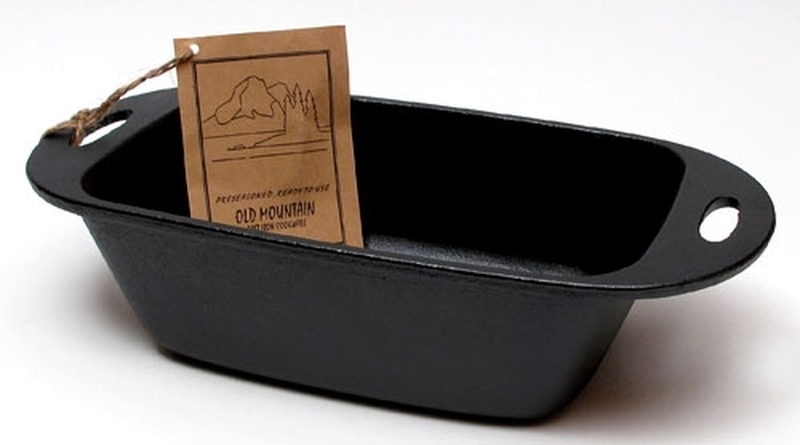 Old Mountain Cast Iron Preseasoned Loaf Pan - Measures 11.75" x 5.75" x 3". Cleaning: After cooking in your Old Mountain cookware, it can be cleaned by putting in hot water and bringing to a boil. Never use detergent to clean seasoned cookware, as it will remove the seasoning: Also, avoid putting hot cast iron into cold water. This can cause cast iron to warp or crack. After pouring out boiling water, wipe dry with a paper towel. If something sticks to the surface, dislodge it by simply using a spoon. Do not use any abrasive item to scrub cookware. Again, this can cut into seasoned surface. While pan is still warm from washing, apply a fine coating of oil or spray on all surfaces.